Well today, I had to drop off some very important mail at the post office at the Lakeshore Plaza USPS post office in San Francisco. 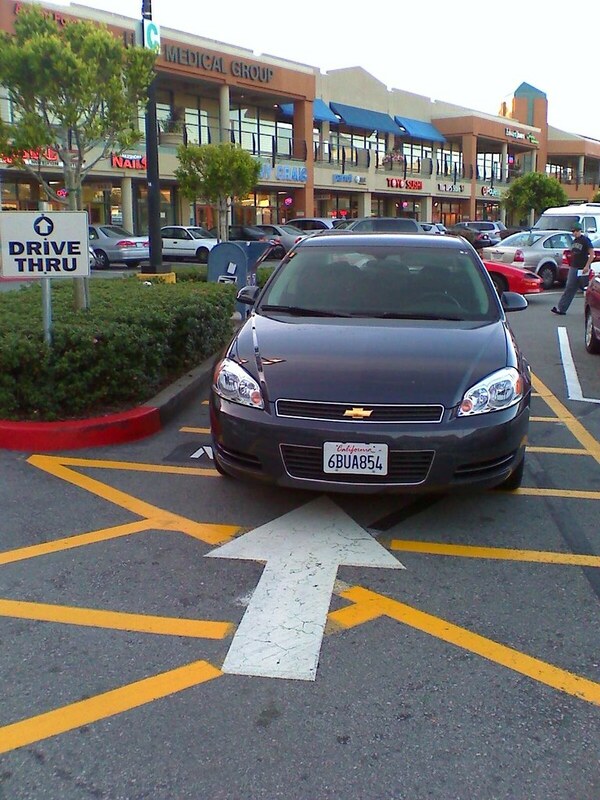 They also feature a drive thru drop-off mailbox since parking can be a little difficult at this location. So I get there, and this clown messes it up for everyone. What's wrong with the photo? Parks car in the drive thru. Parks car the wrong way. Parks car in a no parking zone. Driver is nowhere to be seen, not even the post office. And just to add to the suspense and humiliation, other than posting it on my blog and Flickr photo page, the security guard came by and took a photo of the license plate to send the driver a citation. Do you know who this person is? California License Plate: 6BUA854. Lastly, vote for Akit's Halloween costume! Will he wear the Bill "I Miss Monica" Clinton costume, or will he wear the Arnold "KAA-LEE-FORN-YA" Schwarzenegger costume? Vote on left column on my blog site: http://www.akit.org.